Webster's New World Dictionary defines the word as “any widespread promotion of particular ideas, doctrines, etc.” To some people the word holds negative connotations. However, during WWII, propaganda was used in a positive way throughout the United States. Posters were plastered in bus stations and on subway walls, in grocery stores, and many other public locations. The posters were also reproduced on full pages in newspapers and magazines. In addition to the posters, the government produced documentaries and fictionalized accounts of the war. Several of Hollywood's most successful directors, including John Ford, Frank Capra, John Huston, and George Stevens, enlisted in the Armed Forces. Many of the films were narrated by or featured big name stars such as Jimmy Stewart, Spencer Tracy, Ronald Reagan, Clark Gable, and Katherine Hepburn. The Office of War Information coordinated the efforts of the various film-making entities. Some of the movies were short training films aimed at the newly-minted soldiers, sailors and airmen. 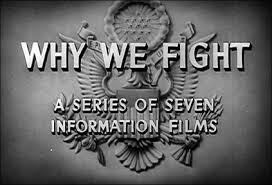 Topics ranged from “How to Fly a B-17” and “How to Shoot a Rifle” to “Materials Handling in AAF Depots.” Others, such as Capra's “Why We Fight” series informed the troops about the Axis powers. 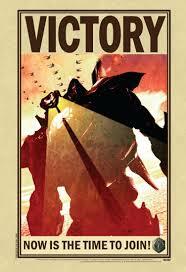 “Prelude to War” is the first in the series and won an Academy Award for Best Documentary Feature. Roosevelt felt “Prelude to War” was so important he ordered that it be distributed to movie houses all over the country. Other movies were directed at the general public. Prior to the attack at Pearl Harbor, a high percentage of U.S. citizens held isolationist views. Afterward, many felt the U.S. should focus on defeating Japan rather than get involved in the war in Europe. As a result, the government produced films to specifically gain support for their decision to partner with England and the other Allied countries to defeat Germany. Propaganda is still used today in books, movies, and other avenues. Can you think of a book you've read or movie you've seen that would qualify?